Ultimate Canola Challenge 2018 trials provide a good reminder when it comes to seeding speed: There is no one BEST speed. 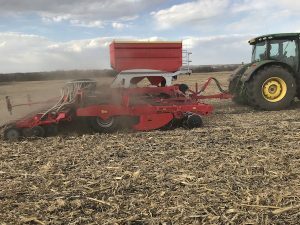 Pottinger disc drill tests different speeds for Ultimate Canola Challenge 2018. Scenario 1: A canola field is seeded May 7 with a 25-foot Pottinger disc drill with 5.5″ row spacing. Normal canola seeding speed for that farmer using that drill is 10 mph. For trial purposes, the farmer seeded strips at speeds of 7, 9 and 11 mph. No fertilizer went down with the seed. Scenario 2: A canola field is seeded May 5 with a 39-foot Morris Maxim drill with 10” row spacing. The gang-packer-style hoe drill has 4″-wide rubber packers. The farmer’s normal canola seeding speed with this drill is 4.5 mph. The UCC trial will compare speeds of 3.5, 4.5 and 5.5 mph.